I breed AKC registered purebred Golden Retrievers because of how my life changed when I got my first Golden, Sam. As a youngster I had grown up with all sorts of muts, and I loved each of them. 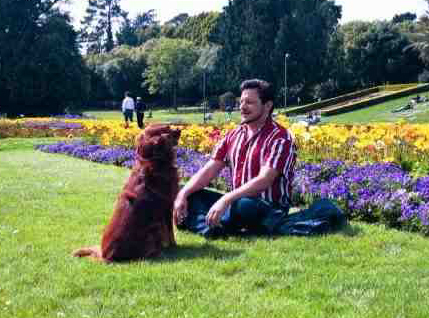 But with Sam I found a far deeper bond, intelligence, and understanding than I had known with any of my prior dogs. As explained more below, when I lost Sam to cancer the emotional pain I experienced was immense. One result of that wonderful relationship, including the loss, was the birth of my desire to learn all I could about the breed, and ultimately that turned into my desire to breed healthy, loving, balanced Goldens that I hope will each provide the same love and bond to their new families that I had found with Sam. So who or what is Samben? Samben Golden Retrievers is my kennel, a small kennel located in Southern California. I am a “hobbyist breeder,” meaning I am a small-time breeder, and my goal is always to keep improving my line and support the families who get pups from me throughout the life of the dog. In other words, I love, train, breed, and show these wonderful dogs. They are my constant companions and live in my house. At any given time you are likely to see Samben dogs engaged in Agility, Field and Hunt activities, Therapy work, Nose work, and Conformation events. At the end of the day, the dogs always come back to what they love best: quiet time at home, lounging in the yard and snoozing on the sofa. 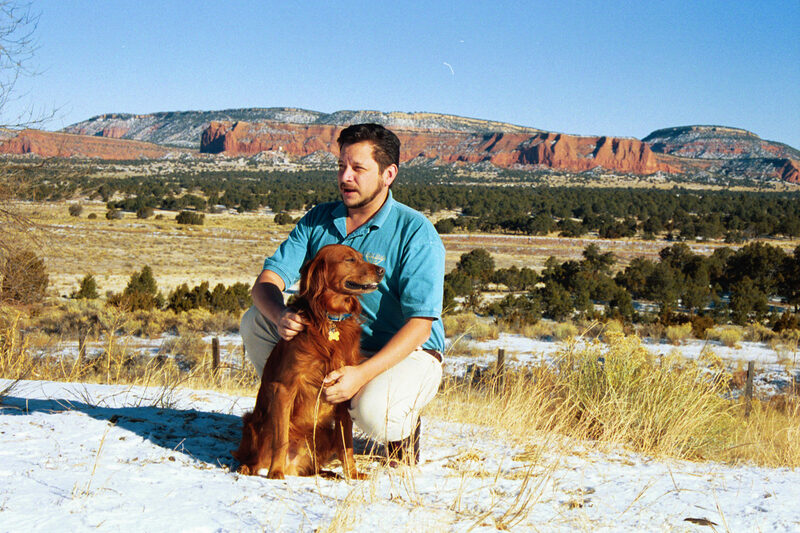 But we – my dogs and I – got here via a fun, and sometimes challenging, path. Here’s some of that story. Above you can see my first Golden Retriever, Sam. The pictures show him trekking all over tarnation; during those days you were equally likely to catch him on the streets of San Francisco, in Griffith Park in Los Angeles, in a truck cab en route to San Antonio or Houston, or any one of countless other places he frequently visited. Back then I was more foot-loose and happy to pack a bag, and anywhere I went Sam happily trotted alongside me. He knew how to behave in a high-rise elevator in downtown Los Angeles, he knew how to carefully pose on a busy sidewalk to ensure he garnered maximum pats and hugs from passers-by, all in the same way he knew how to play ball with a crowd of young children who might happen to cross our path in El Paso, Texas. All of these things he did with joy and merriment, a truly contented dog. It always gave me enormous pleasure to see how happy, well-behaved, and contented he was. And he constantly deflated the stress balloons that I was otherwise busy gathering during my work day. And with a grin and bounce, he would make me laugh and – in a wink – I was happy again. 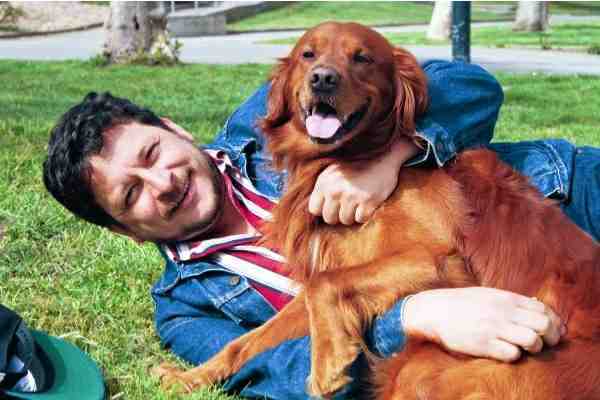 He was a communicative and supportive pal. As someone once told me, Sam always seemed just a hair’s breadth away from human speech. 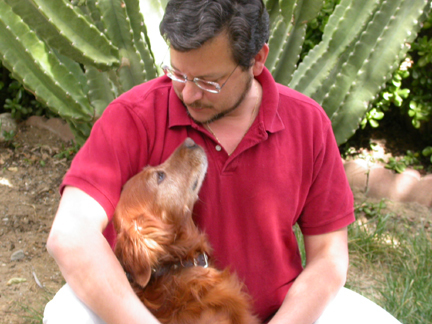 It will come as no surprise, then, that when Sam died of hemagiosarcoma, it broke my heart. 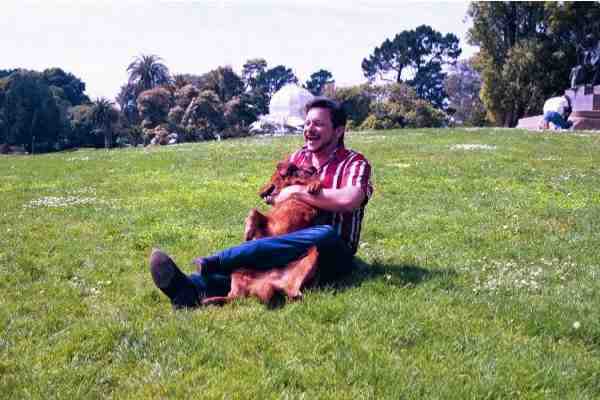 I had known much loss and death before, but somehow losing Sam was more acute than any loss that had come before. When I was finally able to breath again, and noticed that the sun did in fact still rise, I started contemplating options. Ben had come into my life already (that handsome strong-willed fellow featured in the next segment below), as had Ruby (she’s too shy for the camera, as she constantly reminds me), so I had other dogs. Still, I knew I wanted another pup on board in reasonably short order. During those years I had also learned a fair amount about Golden Retrievers, not just from the ones I had owned and those I had looked after for friends, but also from reading and finally really starting to pay attention. For example, I learned quite early on that most people were shocked by how deep red Sam was. 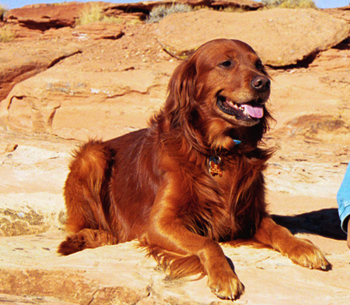 He was frequently mistaken for an Irish Setter. He was a registered purebred Golden with his AKC papers so I knew he was a purebred dog, but I wondered about why his coloring was so uncommon. I started reading. And I started learning that, in decades past, his color was not only frequently seen, for a period it was more the norm among Goldens in the U.S. But I had spent years in France, where I also knew that I had seen very pale, almost white, Golden Retrievers and I wondered why I did not see them in the U.S. The more I read, the more I realized that all of these shades are acceptable according to the breed standard in the country of origin (Scotland), although the extremes are disfavored in the U.S.
Nice to see you! By the way I am Ben! I should pause and introduce Ben to you before I go much further. My traveling with Sam started to slow down when I decided purchase a home in Southern California. I moved into the house in early winter. The house had been vacant while it was on the market, and I quickly learned that various rodents had decided that meant it was available for their pleasure. If you have seen pictures of Southern California’s palm trees, you may see their majesty without knowing they harbor many rodents. But given the choice between a palm tree and an empty house, some of those little critters had decided to see how the other half was living . . . So I was off in search of a Kitty. I hit my local SPCA, patrolling for a feline that would not mind sharing a home with Sam. What I was shocked to find first, however, was a beautiful, grossly overweight and clearly purebred Golden confined in one of the cages. He had just come in that day, had a micro-chip, and the SPCA was sure that his owner would be in shortly to retrieve him. I put my name down all the same. Just in case. Five days later, the owner not having surfaced, I had Ben – the Gentle Giant – on lead and en route to the house. His tail wagged like nobody’s business, and the joy and exuberance in his spirit were a sight to see! He was mine, and I was his. And he knew it immediately. Shortly problems started to surface, however. When he first came to me, Ben could barely walk due to his excessive weight, and despite a relatively cold winter, at first he adamantly refused to come inside the house. He watched Sam come and go through the doggie door, and he and Sam quickly bonded, but Ben simply would not cross that threshold. I cajoled, coaxed, offered treats, nothing doing. So each of those cold winter nights I left all sort of bedding outside for him, worried about him staying outside in the cold night. He destroyed every piece of bedding I left for him, and for weeks I spent the first hour of every morning cleaning up the yard. I tried to coax him into the basement where I had also set up a warm bed for him: nope. Not having any of that either. But he was sweet and gentle, and he patrolled the yard as if a guard dog. This did the trick: the walking coupled with a proper diet, and he began to lose weight. When he checked into the SPCA, the vet there had estimated his age at seven years; after six months with me and after substantial weight loss, he was seen again by a vet. She assessed him as likely two years old. Given how long he ultimately lived with me, he was indeed closer to two years old when I first brought him home. And after many months of refusals, he finally began to come into the house. To my shock, however, another issue surfaced around this time. Twice he bit me. Hard. Once he bit me when I went to close the back door, not having realized that he was headed out to the yard, and another time when, reaching down from the sofa where I was reading, I petted him reflexively without realizing that he was asleep. Both times the moment after he did it I could see his immediate remorse. There was a problem here, this was not the proper Golden temperament, something had pushed this dog far off his natural mark. With these details as I reflected on all of his behavior his backstory started to come into focus. I began to realize he had probably been in a very unhappy home, where he was never allowed outside or to exercise. Speculation I know, but it would explain his persistent refusal at first to come into the house, and his obesity. It likely also explained why his original owner had not come to retrieve him when the SPCA notified him of his whereabouts. If he had reached that weight by the age of two, that meant he had been confined and neglected when his puppyhood and overall development were calling out for socialization, exercise, and mental stimulation. Whoever placed that puppy in that home, no matter how well-intentioned, had made a serious mistake. The owner likely suffered through months of growing frustration and anger, while the developing puppy was neglected and abused. Sad for both. In the long run, however, a boon for me. From this rocky start, Ben turned into the sweetest and most loving huggable bear of a dog anyone could ever hope to know. He never bit anyone again, and he grew to exude joy and happiness, and was particularly loving to senior citizens and those with mobility problems. He also had a great sense of humor; I chuckle even now as I write this, thinking of some of his wily ways and devilish antics! There is so much more I could tell you, and will given the chance, but from these two original boys I received endless gifts. Yes, they gave me my kennel name, but more important they gave me an even stronger and more pronounced love for this breed than I could have imagined that fated day when I first brought Sam home. So, what does this mean for Samben today, and – let’s get real – what does this mean for you, kind Reader? 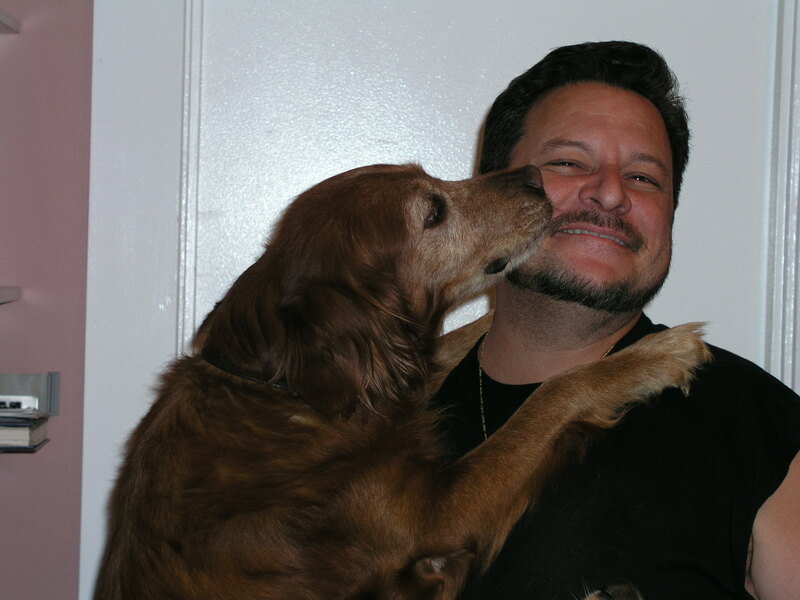 My focus is first and foremost on ensuring that our dogs have happy and healthy lives. Part of canine happiness is fulfillment of their natural instincts, and for a Golden Retriever that typically means the dog wants a purpose, or in other words wants to work. As you will see on these pages and elsewhere, the type of activity that best suits a given dog will vary according to the personality. The best way to know that the work at hand suits the individual dog is to see that happy tail wagging and that face smiling as the dog goes about its work. There are good reasons this breed is one of the breeds used as Guide Dogs for the Blind, as rescue dogs (for example, in the aftermath of 9/11), and so many other inspiring ways that showcase the breed’s intellect, its calm and happy temperament, and its desire to please. 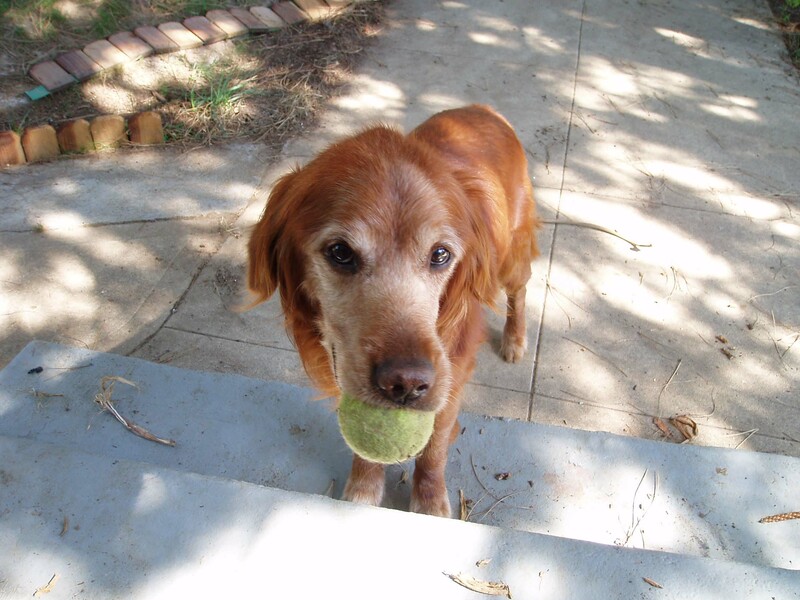 What makes for a healthy, sound, and handsome Golden Retriever? That simple question has many complex and layered answers. Fortunately, history and many relevant guideposts are available to offer help. In these pages I offer what I find to be some important resources, and I hope they will help you as well. A particular, and very important, resource are the many knowledgable long-term breeders and Golden Retriever fanciers who generously make their experience and knowledge available to other breeders as well as the public. 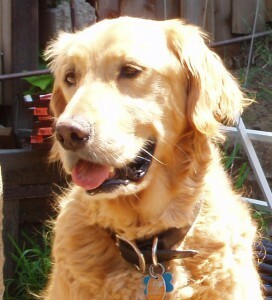 I must stop and specially acknowledge Wendy Lepper, of SpiritLodge Golden Retrievers. Wendy was of immeasurable assistance and an inspiring mentor when I first contemplated breeding these dogs. She bred, raised, and showed Champion Golden Retrievers for many decades in both Canada and the U.S. She remains a great resource for many who are involved in the Breed. I will never be able to repay all of her assistance, but I will try to show the same generosity and goodwill to others that she showed to me for so long. Hence it should be no surprise I believe in sharing with and seeking information from those people, and I believe my own focus is the sharper and better for it. I take full responsibility for my own choices, I am simply lucky enough to be involved with a breed that has many informed resources available for it. To this end, I am a member in good standing of the Golden Retriever Club of America, the Golden Retriever Club of Canada, and the Golden Retriever Club (of England). I firmly adhere to the Code of Ethics of each and all of these Clubs. Here’s a link to take you directly to each one of them: GRCA, GRCC, and the GRC.